We hope you can join us at Science Spectacular 2018! Saturday 20 October 2018, 11am – 4pm, The University of Manchester, Whitworth Hall & Manchester Museum, Oxford Road. Free, drop in, family fun science day! 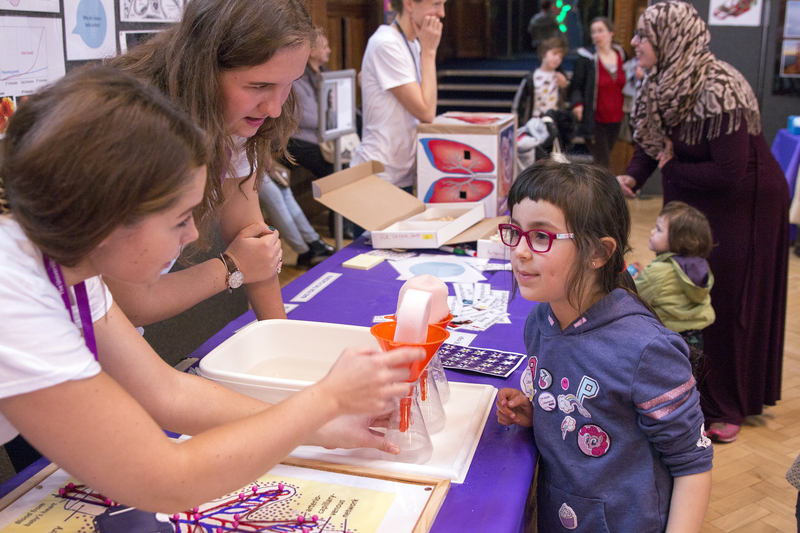 Hurrah the Manchester Science Festival is nearly here and The University of Manchester is playing host to our annual family science fun day Science Spectacular! Join our scientists and engineers for a free fun-filled day of challenges, experiments, and interactive demonstrations. Discover the bugs so viral that they actually infect other bugs, hunt for meteorites, get up close and personal with a dinosaur, and play with colourful chemistry. With more than 40 interactive science activities on offer, including face painting and lucky science dips, there will be something suitable for children of all ages, and there’s plenty to keep adults amused too. Welcoming, entertaining, and inspiring you throughout the day will also be our science buskers, who will be on hand all along Oxford Rd with their own fun and curious facts. And don’t forget you can see our scientists and engineers in action at a range of exciting events taking place during The Manchester Science Festival. The British Science Festival is Europe’s longest standing science festival, travelling to a different place in the United Kingdom each year. It aims to diversify the public’s understanding of science, with an events programme that encompasses it in the broadest sense of the word. Next year, the Festival is taking place in Hull – the 2017 UK City of Culture – and will be hosted by the University of Hull between 11-14 September 2018. Would you like to be involved in the British Science Festival 2018? We’re looking for proposals from across the scientific spectrum and beyond. Festival content should be aimed at non-specialist adults (i.e. aged 16+) with a broad interest in science. We welcome and encourage creative formats and drop-in activities. The deadline for proposals is 9.00am, 19 February 2018. Please visit our webpage for further details. Are you, or do you know, an exceptional early career researcher? Every year the British Science Association asks for nominations for the seven Award Lectureships available to academics who are keen to engage people with their research. These Award Lectures aim to promote open and informed discussion of science and related disciplines. More information, including the application process can be found here. Winners will have the opportunity to present their Award Lecture at the 2018 Festival. Science Spectacular – our annual university-wide family fun science fair – returns for the Manchester Science Festival 2017, and we hope you can join us. Science Spectacular is a key event in the University’s calendar of public engagement events. It provides an interactive showcase for the exciting research taking place across the University and offers the opportunity to engage with audiences of all ages. Running since 2011, we typically attract around 2,000 visitors and have featured prominently as a highlight of MSF. If you haven’t heard of Science Spectacular before, then check out our photo gallery and our short film. This year Science Spectacular will take place on Saturday 21 October in Whitworth Hall and Manchester Museum. We are looking to host 50 interactive table top science stations. So if you’d like to be a part of this year’s event, please return the attached Applications of Interest form by Monday 11 September 2017. Download the application of interest form (doc). Bradford Science Festival – Finding the Surprising Science in the City! The National Science and Media Museum and partners, invites visitors to come out and play, create and experiment with science at the Bradford Science Festival 2017. An exciting new science festival designed to WOW families and young adults with exciting events, experiences and experiments. It’s all taking place in Bradford’s stunning City Park, in the Science and Media Museum plus other accessible but familiar venues. The Bradford Science Festival is all about engaging families and young people with the science that is everywhere in exciting and inspiring ways and using the City of Bradford and Bradford people as inspiration for Finding the Surprising Science in the City! We will be turning familiar venues and attractions into an Interactive Science wonderland. This year’s festival is a launch weekend which will grow over the coming years to become a major annual feature in the city’s cultural and events calendar. Launching with a provocative evening of STEM events aimed at our young adult audience and followed by 2 incredible days of playful and immersive experimentation and discovery, focussed at a family audience. The Festival will develop a unique alliance of partners and supporters, create and support new and innovative projects and engage families and young people who may have low science capital to be excited by the science that is everywhere in their city. For a proposal form and further information, please contact Robin Dark (Partnerships and Learning Project Manager) robin.dark@scienceandmediamuseum.org.uk by 14th April 2017. Be a part of the Fringe Science Festival 2015 in Bradford this September. The Fringe Science Festival will be following on from the British Science Festival which is being hosted by the University of Bradford in 2015. The Fringe is starting on Friday 11 September and going through to Friday 18 September. The Fringe Science Festival is aimed at a young audience, families and the community including schools (Key Stages 2, 3, 4 & 5), and hopes to attract 20,000 people in total from Bradford and beyond during the week. This open call is an opportunity for anyone interested in running an activity/event for these audiences. The theme of the festival is ‘Science’ so it could involve anything from chemistry to religion, from art to engineering. We are open to all formats whether it is an interactive event for children or an engaging workshop for the community as long as it links with science in some way. If you have an idea for an event which your organisation can provide, please complete the short form application form and a member of the Fringe Science Festival team will be in touch with you. The deadline for submissions is Sunday 26 April 2015. Please note: If you have any questions regarding the application, please get in touch with Richard Davany directly R.Devany@bradford.ac.uk. Richard is overseeing the applications and will be best placed to advise on any queries. Pint Of Science 2015 needs YOU! Pint of Science is a 3 day festival, running across four pubs in the Manchester area with four different themes. Pint of Science is already fully established across both the UK and worldwide, including USA, Australia and France. The Pint of Science Manchester team are looking to recruit University of Manchester postgraduate researchers as volunteers for the next festival in May 2015. Voluntary roles include event managers (3 people per theme), publicity and marketing. The University of Manchester is recruiting Science Buskers to support events taking place during this year’s Manchester Science Festival (MSF). The University is taking part in the Manchester Science Festival, and as part of our family fun science fair event – Science Spectacular – we are are seeking enthusiastic postgraduates and undergraduates from all disciplines (registered at the University) who are interested in inspiring and engaging the general public in some science fun. Reliable and committed: If you are selected we will ask you to commit to 4 hours of science busking, from 11:00 – 15:00 on Saturday 25 October, on Oxford Road, Manchester. If you do decide that science busking is for you, you will be invited to attend a mentored practice at Manchester Museum. You’ll then have the opportunity to take part in the Science Spectacular on 25 October. Please note this opportunity is only open to University of Manchester Postgraduates and Undergraduates. For more information about becoming a science busker please contact: Dee-Ann Johnson at: Dee-Ann.Johnson@manchester.ac.uk or 0161 306 4155. Want to be part of the most creative and innovative Science festival in the North West? | Want to meet like-minded people? | Love working with the public? Then why not apply to become an Event Volunteer for Manchester Science Festival 2014. Event Volunteers enhance the overall visitor experience for Manchester Science Festival. You will be meeting and greeting visitors, helping them to navigate their way through the bustling Festival programme and encouraging participation in exciting, cutting-edge science events. This is an invaluable opportunity to gain experience of event management within a large-scale, city-wide festival. If you are enthusiastic, reliable and enjoy working with the public then we would love to hear from you. Please note, Manchester Science Festival Event Volunteers must be aged 18 or over. The deadline for applications is Friday 29 August 2014, 5pm. If you have any questions please contact msf@mosi.org.uk or call 0161 606 0173. In 2014 BBSRC will be marking 20 years of pioneering Great British Bioscience. To mark this important anniversary, we are staging a platform to highlight world-leading bioscience at its best: the “Great British Bioscience Festival”. This is part of a wider year-long programme of anniversary activities. The festival will provide exciting, engaging displays and activities to showcase BBSRC-funded science to a broad public audience across the UK. We expect to fund between 10 and 15 exhibits each of which will first be showcased to an audience local to the host institution before all coming together in central London in November 2014 for a three day festival. It is expected that the festival will be launched by a VIP event on a Thursday evening where top stakeholders from government, academia, industry and the third sector will come together to view the exhibits. The exhibits will be open to all the following Friday, Saturday and Sunday. A press preview will be held on Thursday afternoon. We are looking for a range of exhibits that inform, engage and entertain!